Application indicators are nifty, versatile panel items, mostly icons and usually placed on the top panel on the screen, to provide simple and efficient access to key parts of an application, or just run as a standalone tool. Knowing how to access those parts of a given application, anyone can write an indicator to help integrating it more conveniently into the desktop. Ubuntu One doesn't come with an indicator officially. But an unofficial one is available, and it works great. 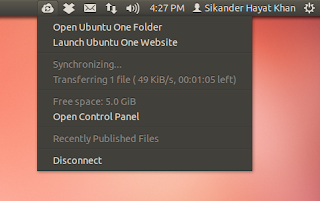 It was updated just recently, and missing options like links to open the Ubuntu One folder, Ubuntu One website, and the control panel were added. It also displays the ETA in the drop-down menu now. The indicator was completely rewritten, this time in the Vala programming language, to make it much more memory-efficient. It would add itself automatically to your Startup Applications, so you don't need to care about that bit. Just re-login for it to start displaying in the top panel.